There is plenty of research to suggest that yellow helps to improve your mood and overall state of mind, so why do we avoid it when it comes to our home? The vibrant hue is often seen as risky, but we like to think of it as bold and daring. If you're not quite sold and still feel a little hesitant, you can start small and contain the burst of color to your washroom. Scroll on for six yellow bathrooms that will convince you to give the sunny shade a chance. 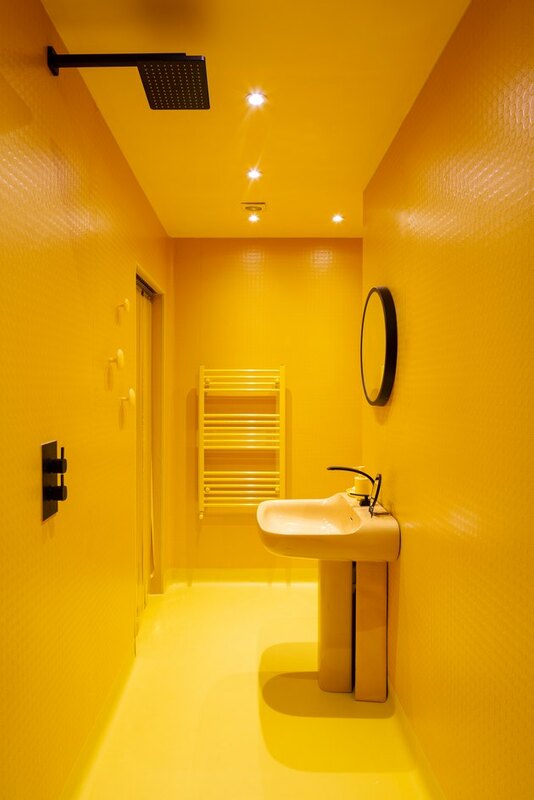 This yellow bathroom was designed after architect Andrew Maynard was told by his doctor that a common contributing factor to mental heath issues during winter may be due to a lack of sunlight and vitamin D. So he thought outside the box and incorporated yellow fixtures and accessories into this windowless washroom to create a vibrant space that does more than just look good. Follow the lead of the team over at GCG Architects and pair yellow with a complementary color. 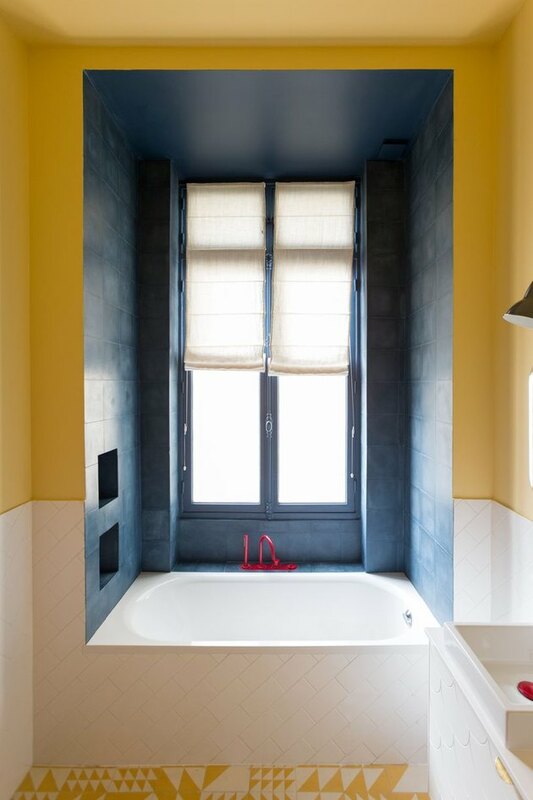 In this Parisian bathroom, yellow walls, ceiling, and floor tile are balanced by grayish-blue wall tile and ceiling paint in the bathtub alcove. And the red faucet is an unexpected but welcome accent. 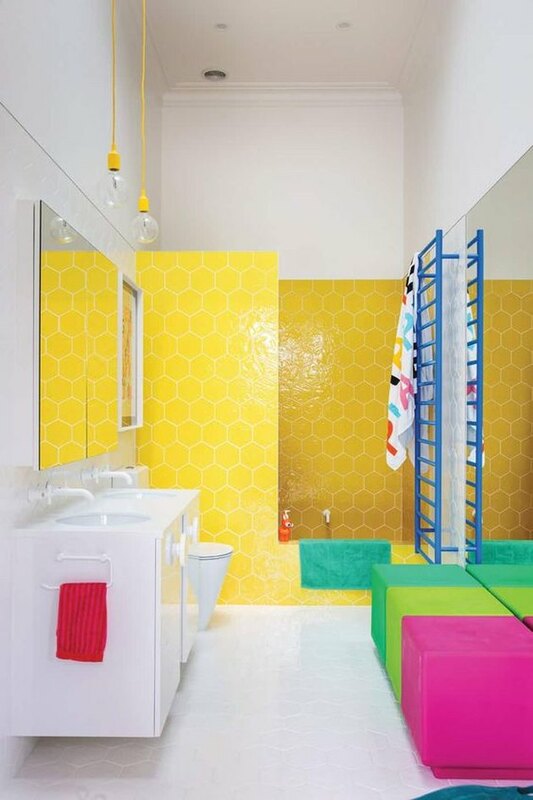 Using large, bright-yellow hexagon-shaped tile is a fun way to make a statement in the bathroom. This playful space belonging to designer Alex Fulton doesn't stop there. She also incorporates neon pink, green, and blue to keep the good times rolling. This room feels like pure happiness. We're dying to stay in this Airbnb on our next visit to Margate in the United Kingdom, where owners Polly and Jim have refurbished the flat next to their design shop, Little Bit Margate. The only compromise they made in this yellow bathroom was the addition of black fixtures. Yes, that's right, even the toilet paper is bright-yellow. 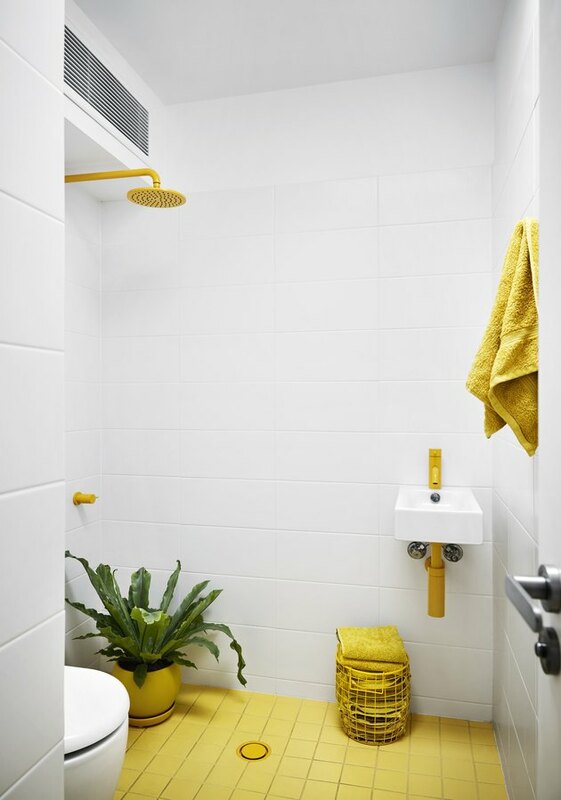 This yellow bathroom designed by Raili Clasen presents a simple way of using the hue by adding just a few sunny details throughout the room. 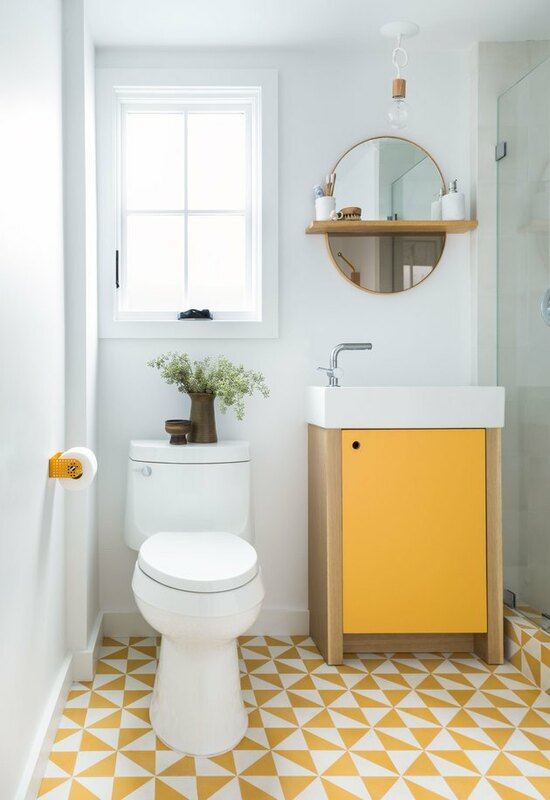 Repurposed cabinetry, a yellow patterned floor, and a yellow toilet paper holder is all this space needs to elevate it from bland to distinctive. Not brave enough to go all in on a yellow bathroom? 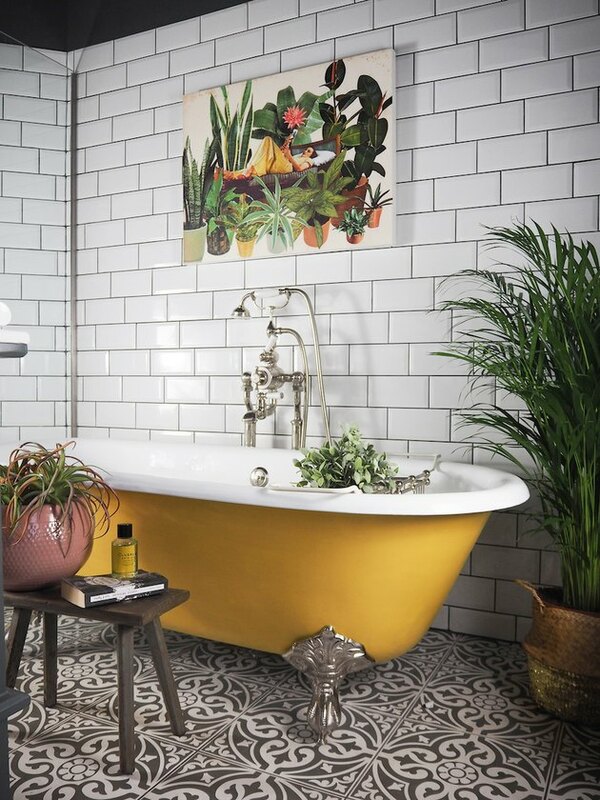 Why not try a marigold freestanding tub instead à la British Instagrammer Sandra Baker. Finish the look with lots of plants, natural accessories, and artwork.